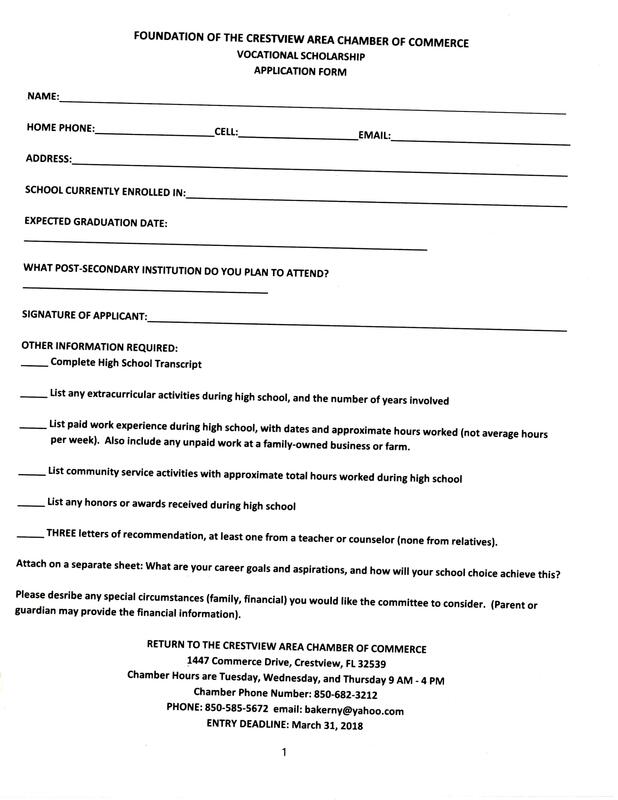 The Crestview Area Chamber of Commerce Foundation Vocational Scholarship is intended to provide financial assistance to students who will enroll in an accredited career program or vocational program at a community college or vocational/career school. Eligible students are high school seniors who will graduate in June, 2018 with a minimum of a 2.5 cumulative GPA. The recipient must enroll in a program leading to a certificate or degree no later than the fall of 2018 and will plan to go directly into employment in that field upon completion of the program. Examples of vocational programs include but are not limited to : automotive technology, aviation/aeronautics, agricultural education, dental hygiene, welding, nursing, computer information technology, construction technology, computer engineering technology, criminal justice technology, digital media, drafting design technology, emergency administration and management, cosmetology, culinary arts, emergency medical services, engineering technology, graphics technology, radiography, and paralegal studies. The scholarships are not intended for general academic pursuits or for students intending to transfer to four-year colleges. Up to $1,000 will be paid to the winner with the amount dependent on tuition cost at the winner’s selected post-secondary institution. The award is intended to support the vocational educational goals of the recipient and will be paid directly to the selected post- secondary institution upon proof of admission.